A continuing shortage of capacity in its flying training organisation has led the UK's Royal Air Force to return to training pilots on Hawk T1 aircraft, three years after it retired the analogue cockpit-equipped jet from this role. Later this year, the RAF will begin training fast jet pilots at RAF Leeming in North Yorkshire using Hawk T1 aircraft from 100 Squadron, which is normally tasked with flying dissimilar or aggressor training missions. An RAF spokesman told Jane's on 21 January, "100 Squadron is not being re-roled and will continue to deliver operational training and dissimilar air combat training. However, as one of several innovative measures, the RAF is planning to use spare Hawk T1 capacity in the squadron to assist with pilot training. This will maximise throughput to the front line while the Military Flying Training System [MFTS] continues to grow." An RAF source confirmed to Jane's that approximately six pilots a year would be trained at RAF Leeming from "this summer". The Hawk T1 variant entered RAF service in 1976 but was retired from the advanced fast jet pilot training role in June 2016 with the disbandment of 206 (Reserve) Squadron at RAF Valley. All UK advanced pilot training then migrated to the 'glass' cockpit-equipped Hawk T2 at RAF Valley. Hawk T1s were retained in the dissimilar and operational flying training role with 100 Squadron and 736 Naval Air Squadron at Royal Naval Air Station Culdrose in Cornwall. The RAF Red Arrows aerobatic team also operates the T1. The UK expects its fleet of some 80 Hawk T1s to be retired by 2030. Just under half of the fleet is used on a daily basis, with the rest held in a spares and maintenance pool. 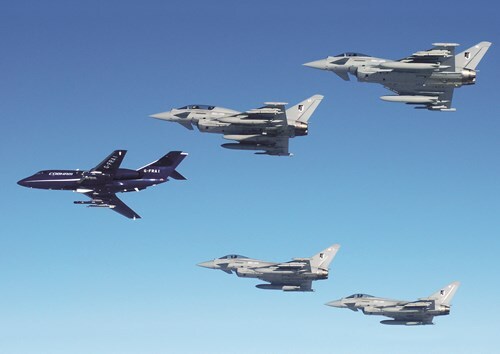 The RAF source said 100 Squadron's aircraft were being used for fast jet training because of a recent surge in recruitment. Aviation enthusiasts are well catered for in terms of the many existing web links which vary greatly in their format, content and purpose. A Google search will provide the enthusiast with a veritable treasure chests of gems. The links below are merely a selection of some which might be of interest to members. Many other great sites exist out there in cyberspace. As real military assets decline we at least can be thankful for the growing proliferation of so many great aviation related websites and apps. On visiting the 100th A.R.S. at RAF Lakenheath, some members requested info about refueling tracks. Thanks to Howard Gent for the weblink. NEWS NOW website - A news link to Royal Air Force posts. Colin Fawcett's photos can be viewed by following this link to his flickr portfolio. For Graeme Hewitt's photos follow the RAPCON link above. For Kev Pye's photos follow the Kev Pye link above. The RSS feed "IHS Janes 360" updates regularly to show the last twenty posts from their website. Click on a headline to read it. Holiday flight booked yet ? Although not military, this NATS video visualization of European airspace on a typical day in summer makes fascinating viewing. Next time you fly give thanks to all the guys of air traffic control, quietly going about their business of keeping Europe's skies safe for us travellers. nose , flaps and tail . 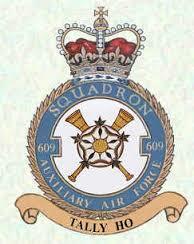 I have omitted these for ease of listing but have given shadow squadron allocations where noted . 2 Hangar is the gym ! A new mod being fitted to the Tucanos as they rotate through here is a Mode S transponder with ZF210 being one of the latest aircraft to have one fitted . The hangar is currently storing the inmates normally housed in 1 Hangar whilst it is being refurbished . Several of these aircraft are missing control surfaces and all of them are in a general ‘untidy’ state . ZF290 207 , in Spray Booth 1 – bofors gun in SB 2 ! There were also overshoots by a pair of Typhoons and a Tornado but no serial numbers were noted . Local author PETER CAYGILL has written many aviation titles of which the latest is about the safety record of the famous RAF fighter, the Lightning. The book The Last British Dambuster by George "Johnny" Johnson (Ebury Press) is available now. 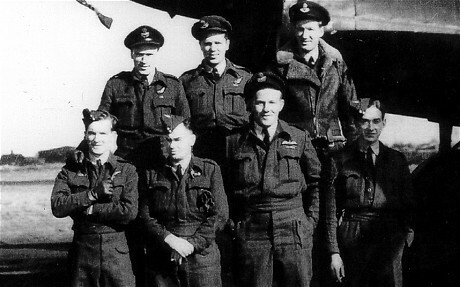 My crew and I were with the 97 Squadron before we moved over to the new 617 Squadron for a special mission in March 1943. In the front row are me, the bomb aimer; Len Eaton, wireless operator; Joe McCarthy, pilot; Ron Batson, front gunner; and behind us are Dave Rodger, rear gunner; Don MacLean, navigator; and Bill Ratcliffe, flight engineer. Joe was the big man and I thought of him as an older brother. We had a friendship that was beyond that of pilot and bomb aimer, and when we first met we just seemed to gel. We had no idea what we were training for until the day of the briefing. I was young enough and stupid enough to not think too much about it. The general conjecture had been that it would be against the German battleship Tirpitz, but the next day, May 16 1943, we discovered how wrong we were when we went to the briefing with Wg Cdr Guy Gibson and the inventor of the bouncing bomb, Barnes Wallis. That was the first indication we had of what the target was going to be – three dams within Germany’s Ruhr Valley. It is difficult to say what the mood was when we found out. At that stage, most people were concerned with their own crew, because the crew were a family, always. But I do know there were one or two who had a nasty feeling they weren’t going to come back. Gibson was a strict disciplinarian and his big problem was that he could not bring himself down to lower ranks. 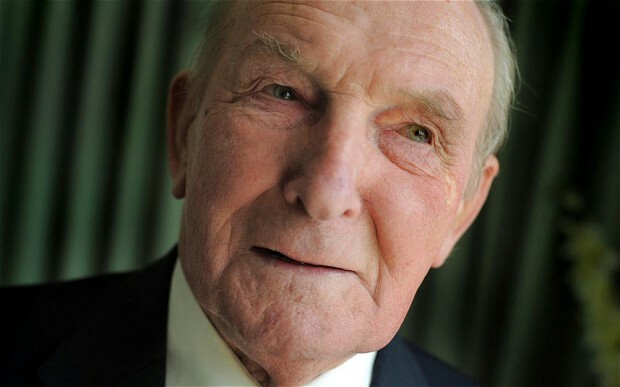 He had no verbal connection with the air crew except to tell them off when something went wrong. But the true essence of the man as a leader was portrayed in the actual raid, where he made the first attack on the Möhne. We knew it was the only dam that was defended. As he called each aircraft in, he flew alongside them to attract some of the defence. He said, ‘You’re doing this, I’m doing this, we’re doing this together.’ That to me is the essence of good leadership. The scale of the raid didn’t hit most of us until we saw the outcome and the number of crews we’d lost – we lost eight of our 16 attacking planes that night and only three of the aircrew from the downed Lancasters survived. We lost 53 crew in total. It was pretty devastating. I’ve talked to school children about the raid and I can see the interest in their eyes. That makes it for me. It’s a relief to know that they’re teaching Second World War history in junior schools. There’s been an increase in the interest over the last three or four years, and I enjoy it.